Note: Site is being actively rebuilt in early 2016. Your patience is appreciated. Eighty-five public library buildings. Ten academic library buildings. Andrew Carnegie's legacy endures in the six New England states. We have pages that include old and new photos and brief histories of each library. No two are exactly alike. Each site carries a story as unique as its architectural style. And while the focus here is on the physical structures, we should not forget that a host of local and regional people were involved in each and every endeavor: no matter how small the town, no matter how large the city. Between 1886 and 1919 Carnegie donated over $40 million to help pay for for 1,679 new library buildings. 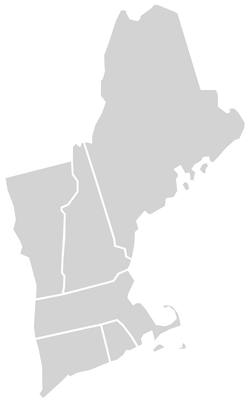 This website details the buildings that were built in the six New England states: Vermont, New Hampshire, Connecticut, Massachusetts, Maine and Rhode Island. To have lost only three buildings over the course of a century may speak to the power of history in New England. At least 20 of New England's Carnegie libraries are listed on the National Register of Historic Places. 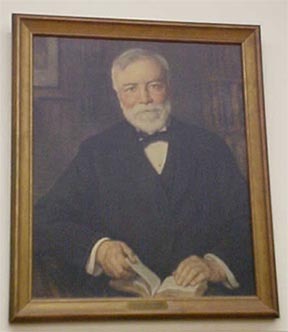 If you don't know much about Mr. Carnegie, you can read a biography posted by the Carnegie Corporation or read about his legacy, including his commitment to libraries and lifelong learning. Many thanks go out to the librarians and historians who provided details and photos about the buildings they enter every day. This project would be incomplete without their help. All photos and postcards are from the compilers' own collection, unless otherwise credited. Please feel free to get in touch if you have additional details to share.